Wait until you hear what Ol’ Man Grognard said about Lands of Lunacy! 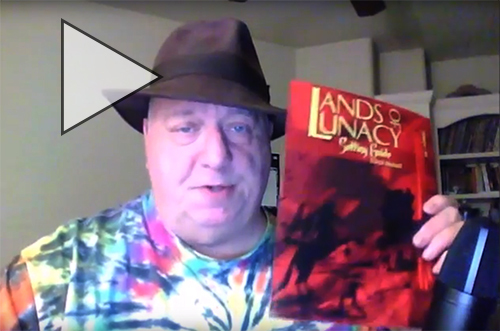 Ol Man Grognard got his mitts on Lands of Lunacy, you will want to hear what he had to say! Expect a grumpy ol’ Grognard to tell it like it is, and he does. The Fail Squad Games crew considers it an honor to be reviewed by such an icon in the Old School world as Glen Hallstrom. Glen is no slouch when it comes to classic gaming, and I have to admit to being a little nervous when he said he would give it an honest look and an honest review. Well, I think the video speaks for itself, it’s time to sit back and smile…. Until Glen pulls this out of his bag at the gaming table! You can check out his entire youtube channel HERE. He covers TONS of gaming topics, products and discussions. Glen managed to completely encompass all of our favorite things about the Lands of Lunacy setting, and present it in a way that had us running to the gaming table (Or from it with insanity). Thank you Mr. Grognard for your kind words and plugs. There will indeed be more to come for Lands of Lunacy. Click on the video below to watch it in it’s entirety. Want yours? Shipping begins 12/8/16 – order yours now supplies limited! Tell us how your Lands of Lunacy game has gone! What happened in your adventures? Questions? comments? Did you make your own review? SHARE IT!! Let us help you spread the word!